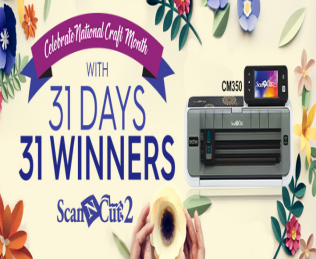 Brother CM350 Giveaway Sweepstakes – Win a ScanNCut 2 machine! Win a Brother ScanNCut 2 machine (31 winners)! ENTER SWEEPSTAKES HERE – Brother Sweepstakes page. ENTRY LIMIT – Only one entry per person during the Sweepstakes Period. ELIGIBILITY – To enter the Sweepstakes you (“Entrant”) must be a lawful permanent resident of the Continental United States or the District of Columbia, have reached the age of majority in the state within you reside and hold a valid U.S. driver’s license. SWEEPSTAKES ENTRY PERIOD – The Sweepstakes begins at 9:00 a.m. Eastern Time (“ET”) on March 1, 2017 through 11:59 p.m. ET March 31, 2017. PRIZES – Thirty-one (31) random winners will receive one (1) Brother ScanNCut2 CM350 machine (M.S.R.P. $399.99). 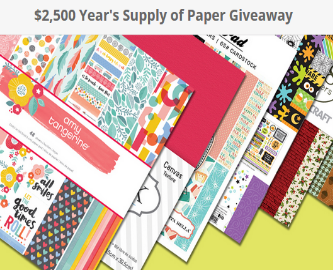 Scrapbook.com’s $2,500 Year’s Supply of Paper Giveaway – 5 winners! Win 47 packs of scrapbooking paper (5 winners)! ENTER SWEEPSTAKES HERE – Scrapbooking.com Sweepstakes page. ENTRY LIMIT – Limit: One mail-in entry per day. By following the steps at the link online there are other activities that permit additional entries in a given day. ELIGIBILITY – Scrapbook.com’s $2,500 Year’s Supply of Paper Giveaway (the “Promotion”) is open only to legal residents of the fifty (50) United States (including District of Columbia) who are at least eighteen (18) years old at the time of entry. SWEEPSTAKES ENTRY PERIOD – The Promotion begins on March 1, 2017 at 12:00 a.m. Mountain Standard Time (“MST”) and ends on June 30, 2017 at 11:59 p.m. Pacific Standard Time (“PST”). 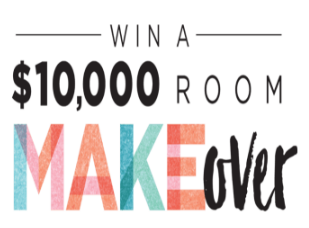 Michaels Room Makeover Sweepstakes – Win a $5,000 gift card & more! 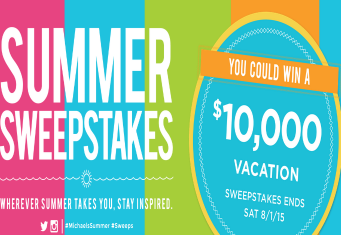 Win a $5,000 AMEX gift card & $5,000 of Michaels home decor! ENTRY LIMIT – Only one (1) Entry or AMOE per individual during the Sweepstakes Period is allowed; multiple entries using different email addresses for a single individual will be disqualified. ELIGIBILITY – The Michaels Room Makeover Sweepstakes is open only to legal residents of the 49 continental United States (excluding Hawaii), Washington, DC and Canada (excluding the Province of Quebec) who are at least eighteen (18) years of age as of February 19, 2017. SWEEPSTAKES ENTRY PERIOD – The Sweepstakes begins at 12:00:00 a.m. Central Standard Time (“CST”) on February 19, 2017 and ends at 11:59:59 p.m. CST on March 4, 2017. PRIZES – The Prize Winner will receive a room makeover valued at $10,000 USD or CAD (depending on the nationality of the winner), consisting of $5,000 of Michaels décor and a $5,000 American Express gift card. Approximate Retail Value (“ARV”) of the Prize is not more than Ten Thousand US Dollars (USD $10,000.00), and not less than CAD $10,000.00 (depending on the nationality of the winner). 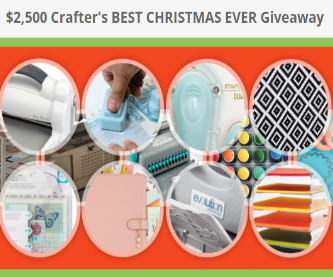 Scrapbook.Com $2,500 “BEST CHRISTMAS EVER” Giveaway – Win paper crafting tools! 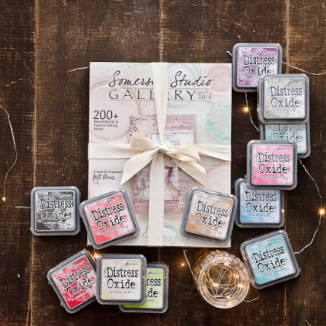 One (1) Grand Prize Winner will have the BEST CHRISTMAS EVER and receive a huge bundle of crafting supplies, including Sizzix’s Big Shot PLUS Machine and the hard to find We R Memory Keepers’ Precision Press Stamping Tool! ENTER SWEEPSTAKES HERE – Scrapbook.com Sweepstakes page. ENTRY LIMIT – Limit: One mail-in entry per day. ELIGIBILITY – The $2,500 Scrapbook.com Crafter’s “BEST CHRISTMAS EVER” Giveaway (1 Grand Prize Winner and 4 Runners Up) is open only to legal residents of the fifty (50) United States (including District of Columbia) who are at least eighteen (18) years old at the time of entry. SWEEPSTAKES ENTRY PERIOD – The Promotion begins on October 24th, 2016 at 12:00 a.m. Pacific Standard Time (“PST”) and ends on December 31st, 2016 at 11:59 p.m.
One (1) $450 Gift Certificate to the Scrapbook.com Superstore will give no warranty or guarantee in respect to all prizes. FOUR (4) Runners Up prizes will be awarded. Four (4) winners will receive an electronic (email) Gift Certificate Code in the value of $125 US Dollars to the Scrapbook.com superstore. 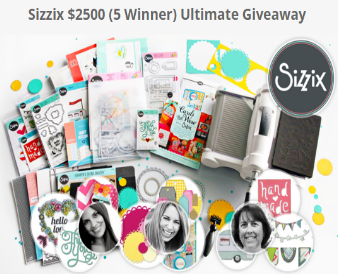 Sizzix $2500 Ultimate Giveaway – Win $500 worth of Sizzix products! 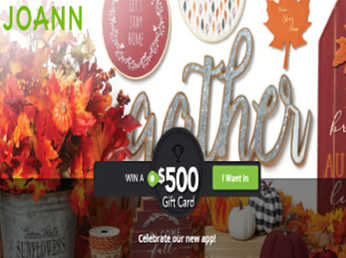 Win $500 worth of Sizzix products (5 winners)! ENTER SWEEPSTAKES HERE – Scrapbooking.com Sweepstakes page. (there should be a pop-up to click to go to the sweepstakes or there will a photo with a link to click). 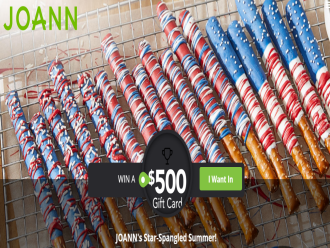 ELIGIBILITY – Sizzix $2500 (5 winners) Ultimate Giveaway is open only to legal residents of the fifty (50) United States (including District of Columbia) who are at least eighteen (18) years old at the time of entry. SWEEPSTAKES ENTRY PERIOD – The Promotion begins on April 1st, 2016 at 12:00 a.m. Pacific Standard Time (“PST”) and ends on June 15, 2016 at 11:59 p.m.
PRIZES – Grand Prize: FIVE (5) Grand Prizes will be awarded. Each winner will receive assorted Sizzix supplies valued at approximately $500 retail. 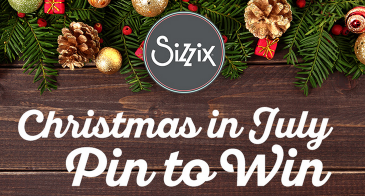 Sizzix The ‘Christmas in July Pin to Win’ Sweepstakes – Win a Big Shot Plus & more! Win a Sizzix Big Shot Plus & more! ENTER SWEEPSTAKES HERE – Sizzix Facebook page. ELIGIBILITY – Open to legal residents of USA, Canada and Mexico who are 18 or older. PRIZES – One winner will receive a Sizzix Big Shot Plus and tools to complete the projects from the sweepstakes.